I recently reviewed Nemosine Blue Snowball Nebula Twinkle, and loved it, so I wanted to give Nemosine's other Twinkle ink a try: Nemosine Coalsack Nebula Twinkle. I purchased my samples of ink from Goulet Pens. 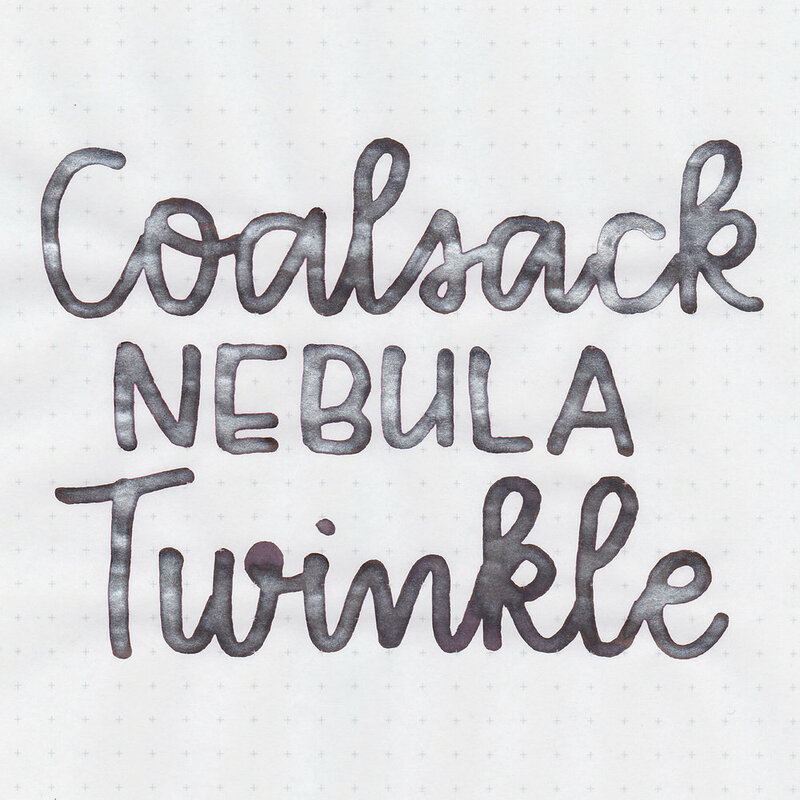 Coalsack Nebula Twinkle is a black ink with silver shimmer. It does lean a little bit toward purple. There is a lot of shimmer in this ink. The ink drops show off the underlying red tone that seeps out and creates a little red halo around some of the drops. Water resistance: Medium-some of the ink washes away, but you would probably still be able to make out what it said. Show through: Medium-on some of the papers you can see the red undertone in the show through. Bleeding: Low-it bled a little bit in the flex nib on Tomoe River paper. Other properties: Low shading, no sheen, and silver shimmer. On 20 pound copy paper there was a little bit of feathering but other than that it did really well. Ink swabs for comparison, left to right (top to bottom for mobile RSS): Nemosine Blue Snowball Nebula Twinkle, Nemosine Coalsack Nebula Twinkle, and Diamine Arabian Nights. Click here to see the Nemosine inks together. Diamine Moon Dust, Diamine Sparkling Shadows, and Diamine Night Sky. Click here to see the black inks together. I have not reviewed these three inks yet, but I wanted to include them for comparison. I used a Pelikan M400 White Tortoise with a vintage 400N nib on Tomoe River paper. The ink was a little on the wet side, which helped it keep up with the flex nib. In a flex nib, this ink is amazing. It's like the fancy version of the little black dress you wear to the New Year's Eve party. It's basic black, but with the shimmer it becomes the fancy version of a classic. Overall, I really like this ink. Both Nemosine Twinkle inks have really impressed me with how consistent the shimmer is. I do think I would buy a full bottle of this ink, it's not one I would use everyday, but definitely for holidays and special occasions. I wish Nemosine had more than just the two Twinkle inks, because so far they are my favorite brand for shimmer ink.